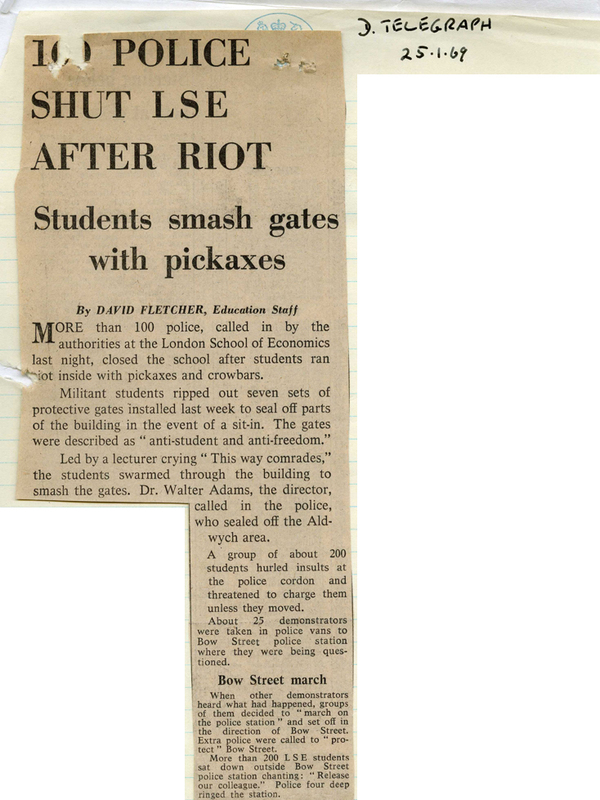 More than 100 police, called in by the authorities at the London School of Economics last night, closed the school after students ran riot inside with pickaxes and crowbars. Led by a lecturer crying “This way comrades,” the students swarmed through the building to smash the gates. Dr. Walter Adams, the director, called in the police, who sealed off the Aldwych area. A group of about 200 students hurled insults at the police cordon and threatened to charge them unless they moved. About 25 demonstrators were taken in police vans to Bow Street police station where they were being questioned. When other demonstrators heard what happened, groups of them decided to “march on the police station” and set off in the direction of Bow Street. Extra police were called to “protect” Bow Street. More than 200 LSE students sat down outside Bow Street police station chanting: “Release our colleague.” Police four deep ringed the station.